An overflowing bánh mì, a tray of tender bánh da lợn, a can of soybean milk: my treat after every monthly trip to the little Vietnamese grocery across town. Mekong Market was my Sunday Bible school of Vietnamese culture in a childhood as distant from Asia as one could imagine, in Cincinnati. Snacks, sauces, and canned foods defying translation lined the shelves; in the refrigerator, a variety of mystery meats wrapped in aluminum foil each bore the same place of origin: Chicago. One Labor Day, my family made a trip up to Chicago to finally see the bustling Vietnamese community whose clearance we had happily bought for years. We made a lot of road trips back then, often just spur-of-the-moment driving through the peaceful countryside. But since we were headed five hours away to an unfamiliar city, we needed to plan ahead. 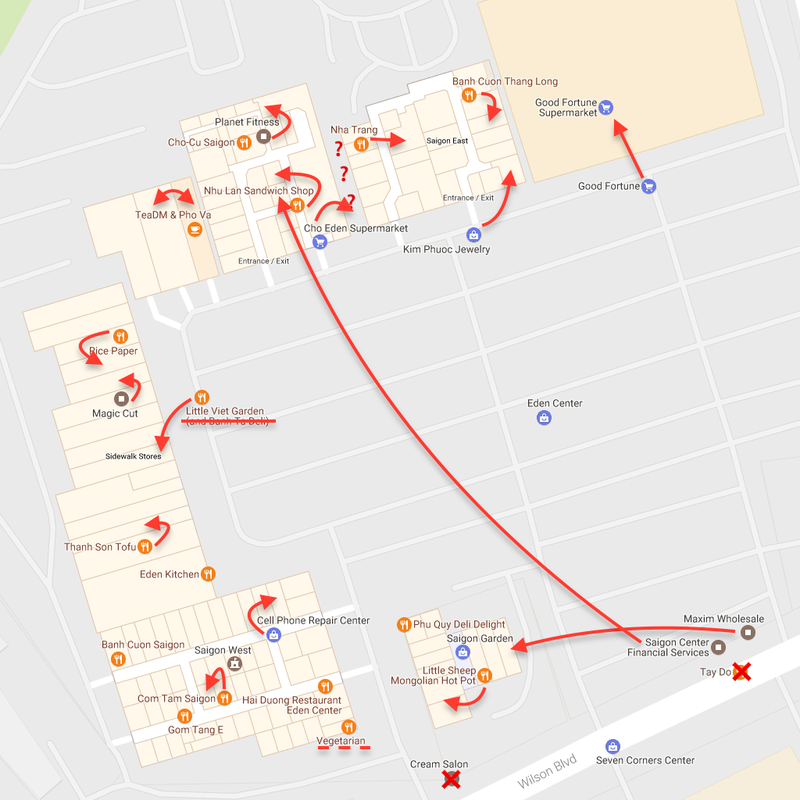 As the resident map enthusiast, I was to find directions to the Vietnamese supermarket in Chicago using our new Internet connection. We’d enjoy some phở for lunch and bring back enough fresh ingredients to avoid Mekong Market for a little while. 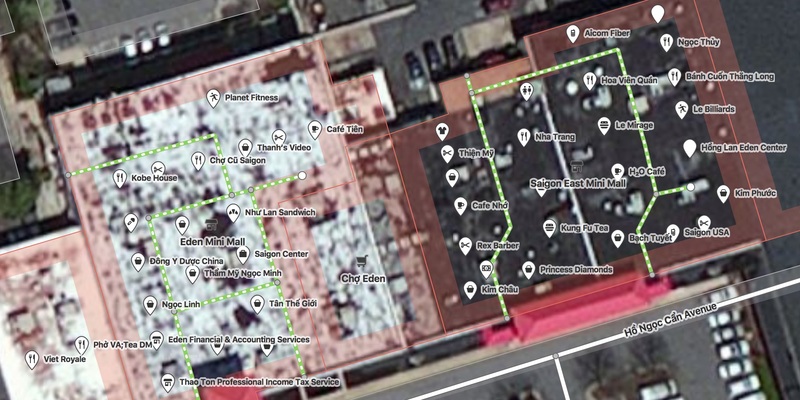 A search for “Vietnamese markets in Chicago” on AltaVista turned up an article from The Washingtonian describing a cluster of supermarkets, phở restaurants, and bakeries on Wilson Boulevard. I pasted the street address into MapQuest, specified “Chicago” and “Illinois” to make sure I got the right “Wilson”, and printed out the directions. 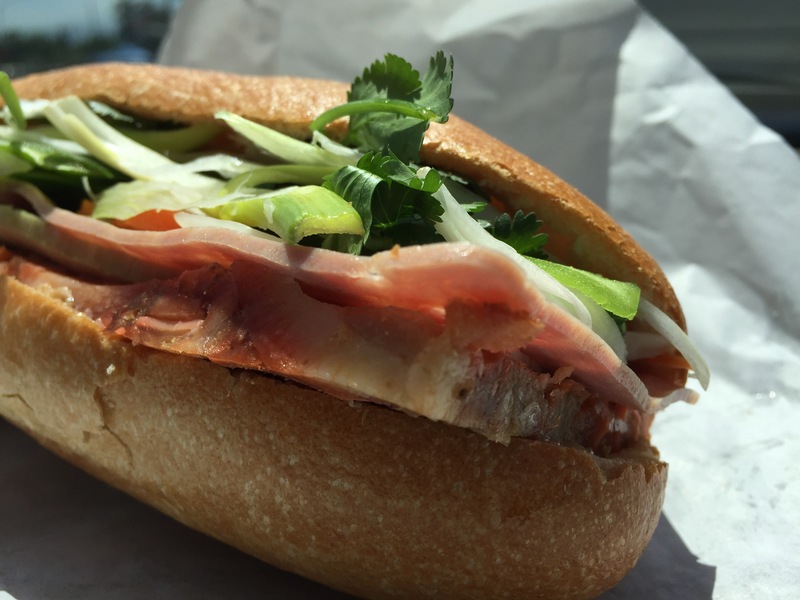 A Vietnamese cold cuts sandwich (bánh mì thịt nguội). As my father held his tongue – Grandma was in the back seat – we wandered aimlessly around that part of town until we happened to spot some Vietnamese signage. There, just a few minutes away from Wilson Avenue, were the supermarket, phở restaurant, and bakery we had been hoping for, by sheer luck. In the years since, I moved to San José, California, home to one of the largest populations of Vietnamese Americans in the country. Bánh mì shops here are as commonplace as cafés. In fact, the only reason I ever notice them is that I also became immersed in OSM. I found a niche mapping “flyover country” and made it my mission to improve coverage of communities underserved by commercial map vendors, among them ethnic enclaves in San José, Orange County, and elsewhere. Last month, I happened to be in Washington, D.C., visiting my employer Mapbox at the new office there. On a lark, I decided to spend Sunday afternoon visiting Wilson Boulevard for real. It had been almost eighteen years since my last attempt, but despite having since moved to a city with a large Vietnamese population and plenty of Vietnamese food, I figured seeing this street in person would give me some closure. Fortunately, the same Metro line that took me almost to the airport also took me almost to Eden Center, the Vietnamese shopping center that had teased me back in grade school. No Vietnamese shopping center would be complete without a kitschy gate. Like similar centers in Orange County, Eden Center is steeped in war history. 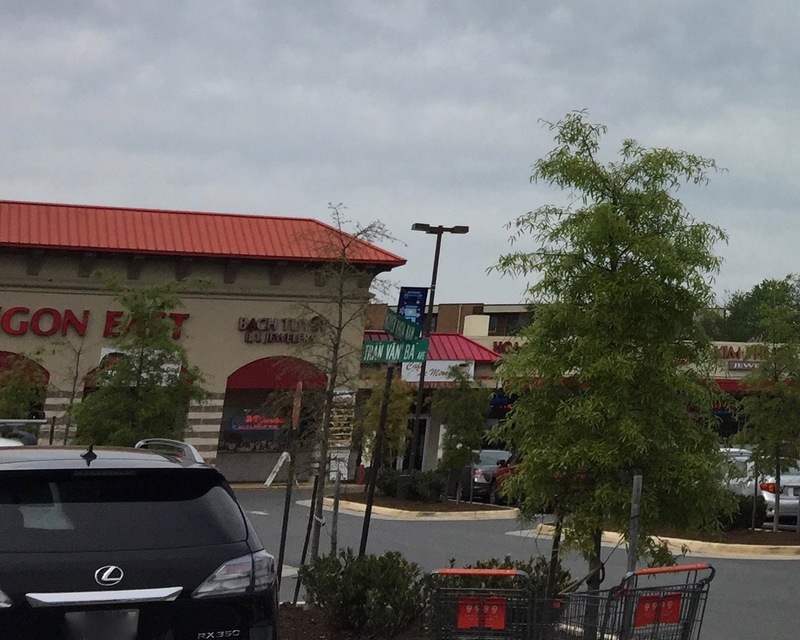 Each aisle in the parking lot bears the name of a South Vietnamese general. 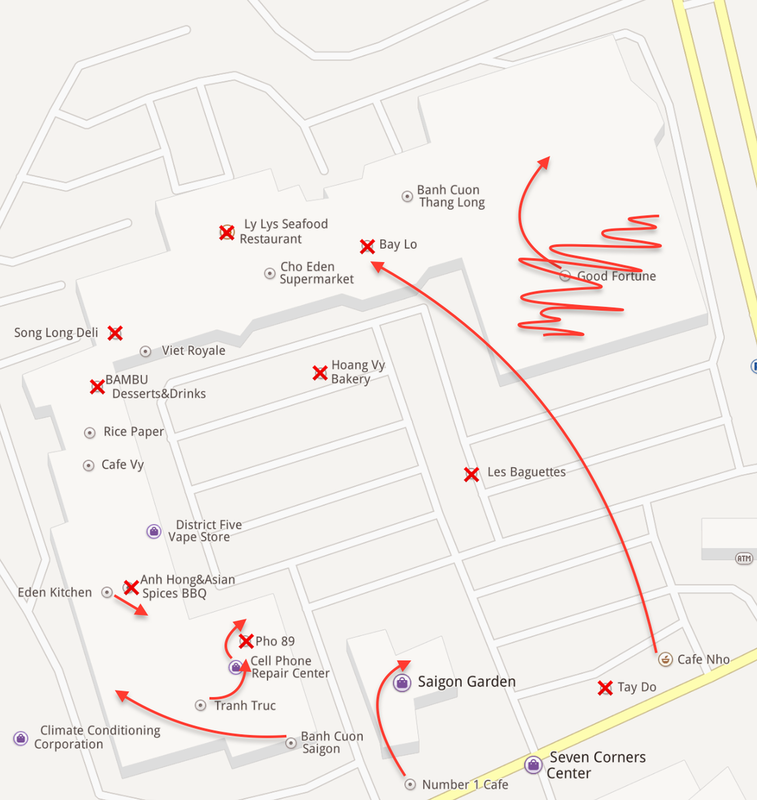 At the intersection of Nguyễn Khoa Nam and Trần Văn Bá “Avenues”. The South Vietnamese flag flies proudly beside the American flag. 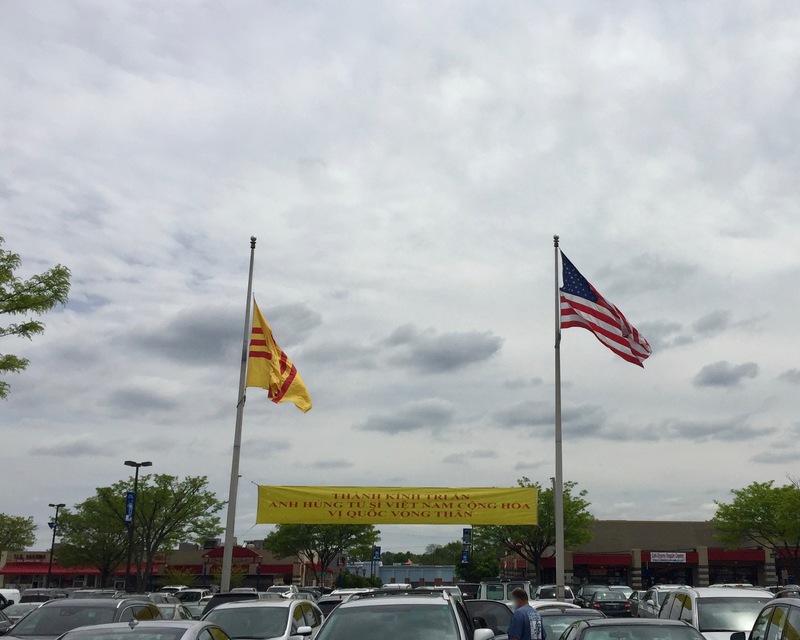 As it was the week before the anniversary of the Fall of Saigon, a banner spanning the two flagpoles honored South Vietnamese war heroes. The banner reads, “With Gratitude We Revere the Martyred National Heroes of the Republic of Vietnam”. 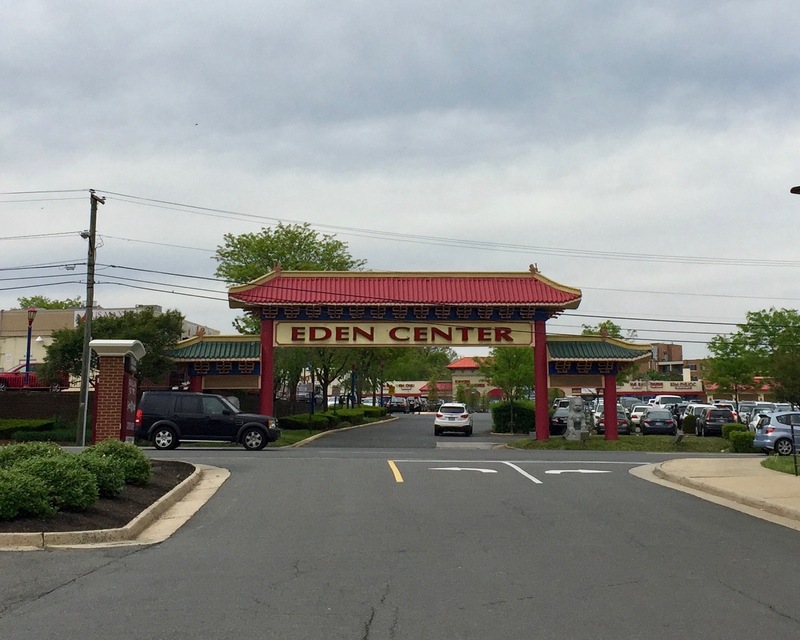 I thoroughly field-surveyed Eden Center, noting the restaurants, jewelers, beauty salons, travel agencies, and karaoke bars tucked away in the center’s “mini-malls”. Before leaving, I bought a bánh mì, a piping hot tray of bánh da lợn, and a can of soybean milk for the road. The whole reason I got involved with “citizen mapping” is that proprietary map sources fall so short when it comes to places beyond San Francisco, beyond the central business districts, beyond the tourist traps. Apple Maps includes only a few shops, but they’re all in the wrong places and some are no longer open. 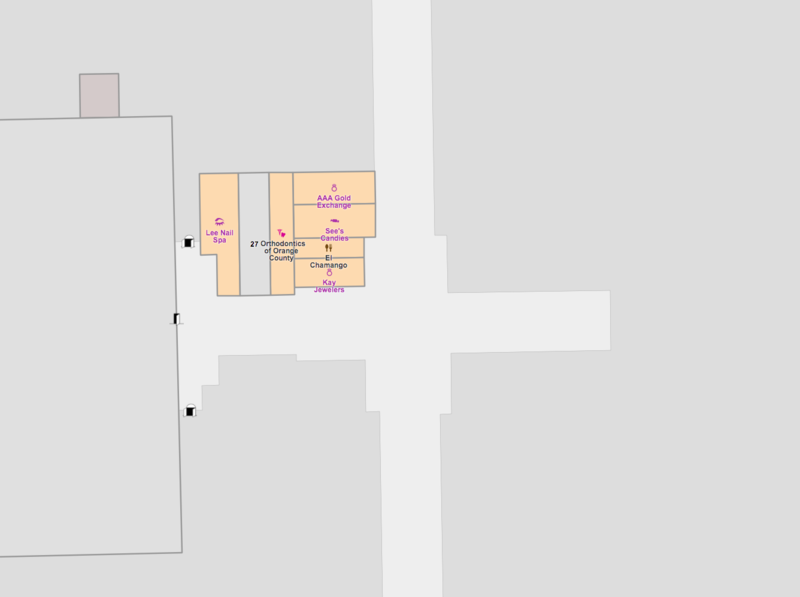 With the same indoor mapping style it applies to every mall, Google Maps makes it look like it has spectacular coverage of Eden Center. But it’s just walls: most of the shops are still in the wrong location and some have closed. I found it surprising that Baidu Maps has coverage of this area on par with Apple Maps, but it too has misplaced and outdated points of interest. 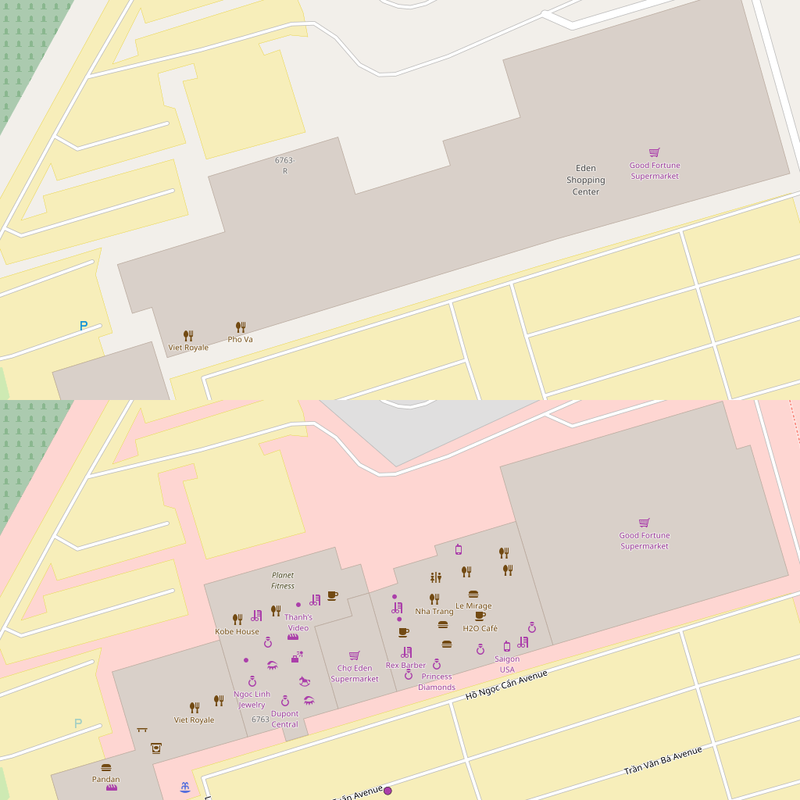 OSM didn’t have a lot of detail about Eden Center until I ventured there last month, but now it’s complete, accurate, and up-to-date. Even the parking aisles are named. It’s looking a lot better than the competition. 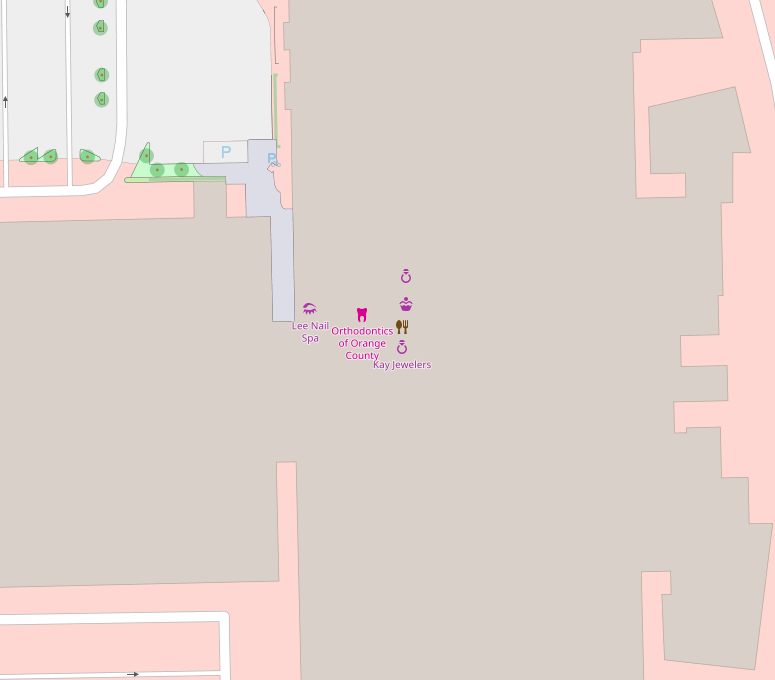 One of the advantages of a human-curated map database is an at-times quirky attention to detail. 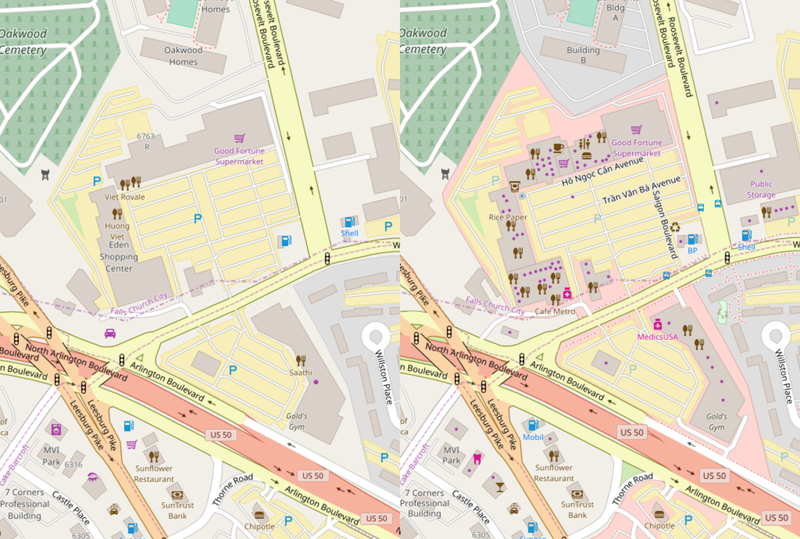 The abundance of diacritical marks in Vietnamese are essential to comprehension, so this Vietnamese-American community will find it helpful that OSM includes the diacritics, even though this shopping center is located in a predominantly English-speaking city. Maybe someday the highway=corridor ways will be useful for pedestrian routing, too. OSM may have a long way to go before it can even dream of breaking people’s Google habits. I’m under no illusions about how poorly it scales to visit each site in person via public transportation. But for now, I’m just happy to have finally made it to Wilson Boulevard and made it easier for others to do the same – minus the detour. Instead of adding nodes you could use the Simple Indoor Tagging scheme. Don’t worry about the names and icons, as still show like it does in the tile render and it doesn’t show the room outline. But once you go to an indoor viewer, you get the expanded usage. Here’s an example of what I’m currently working on. What it looks like in OpenLevelUp!